Policy, media and academic attention on violence in the Sahel region has been widespread since the onset of the Arab Spring, and the escalating violence in recent months in Mali. This research explores the nature, patterns and dynamics of this violence in regional and national comparative perspective, contrasting divergent dynamics of violence both within and across the region. Data is drawn from the Armed Conflict Location & Event Dataset (ACLED), which facilitates analysis of both contemporary and historical patterns. Regional characteristics of Sahelian violence are highlighted, which underscore a relatively low level of violence in the region as a whole, with increases in conflict levels largely driven by the single case of Mali in recent months. Detailed analysis of specific groups and actor types reveal important intra-regional discrepancies which have been largely obscured by characterisations of a regional, trans-national crisis. Together, these observations point to the need to interrogate narratives of regional dynamics which may conceal important national and even sub-national variations and drivers of political violence. Event data is drawn from the Armed Conflict Location & Event Dataset (ACLED), which collects and publishes data on political violence across the African continent.2 A politically violent event is defined as a ‘single altercation where often force is used by one or more groups for a political end,’ with each individual altercation coded as a discrete event between designated actors, at a specific geo-referenced location, on a single day (Raleigh, Linke and Dowd 2012). Violent events are also distinguished by event type and whether they involve altercations between armed groups (battles), between unarmed civilians and an armed group (violence against civilians) or between demonstrators protesting peacefully or through use of force themselves (riots/protests). 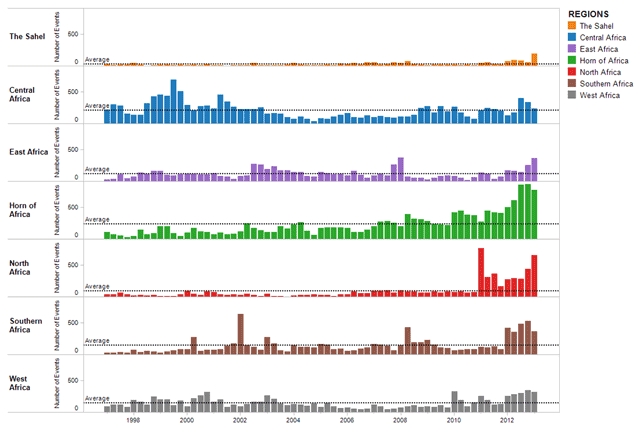 The standardised structure of ACLED event data allows for meaningful comparative analysis of violence levels, patterns and dynamics across countries, regions and time periods (Raleigh et al. 2010). Analysis can be supplemented with data on fatalities – although this is subject to a greater degree of bias and uncertainty – in order to provide an estimation of intensity of violence associated with each event. The Sahel’s violence can be characterised in four ways. Firstly, in comparison to other regions across Africa – central, eastern, the Horn, northern, southern and western3 – conflict rates in the Sahel are relatively low. Between 1997 and late 2011, political violence was both limited and consistent, with a very gradual increase in underlying violence levels over time (see Figure 1). In this way, the region differs from North Africa, which witnessed a sudden and sharp increase in violence in 2011 and 2012 following very little change over the preceding decade. While North Africa is often considered comparable to the Sahel region, the magnitude of the increase in violence in northern countries is actually far greater than has been witnessed in the Sahel in recent years. 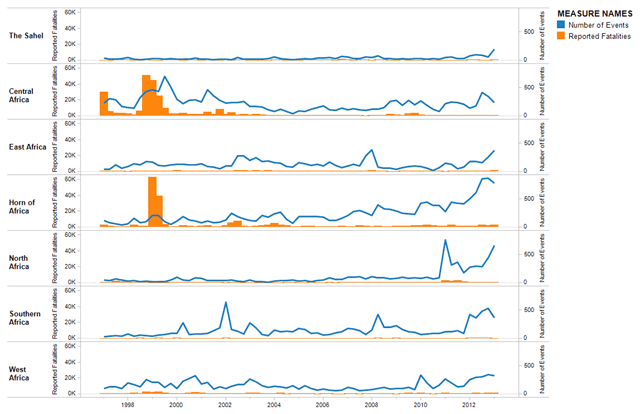 Sahelian violence is also distinct from patterns in West Africa, which is characterised by consistently mid- to high-levels of violence with very little variation over time (see Figure 2). The second characteristic of Sahelian violence is its lack of volatility compared to other regions across the continent. While other regions – such as Southern Africa – are shaped by sudden and sharp spikes in conflict events over time, the Sahel has displayed a low ‘baseline’ rate and a gradual trend line increasing over time in spite of several active conflict groups in the region. Almost every region in Africa has experienced an increase in absolute terms since 2011; and while the Sahelian increase is considerable relative to its previous levels of violence, it is still the least ‘active’ region across the continent. As a proportion of total political violence on the African continent, the Sahel represents just 2.74 per cent of all violent conflict events in the ACLED, peaking in the first quarter of 2013 when it constituted 6.49 per cent of all political violence events. Most of the increase in Sahelian violence since 2011 has been driven by conflict events in Mali almost exclusively, with some growth attributable to rioting and protesting in Mauritania (see Figure 3). Within Mali, several forms of violence contributed to the intermittent increases in conflict events and the recent crisis, including electoral unrest, high rates of communal violence and separatist Tuareg uprisings. 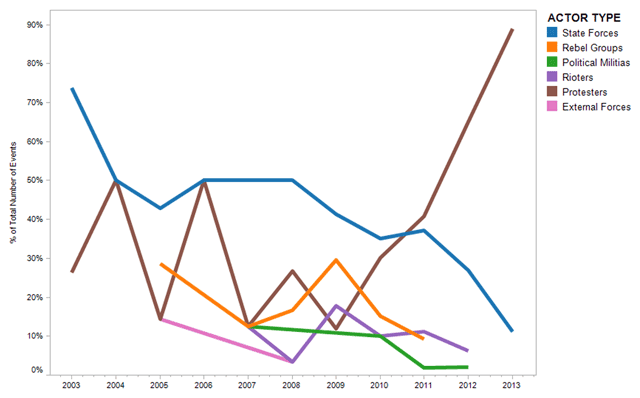 Figure 4 charts the evolution of Mali’s conflict since 1997. Sahelian violence is also characterised by a diverse range of conflict actors. While the proportion of government involvement in conflict is relatively stable across all parts of Africa, the proportion of violence perpetrated by other non-state groups vacillates considerably from region to region (see Figure 5). In the Sahelian spectrum of political violence, rioters and protesters, as well as political and communal militias, are almost as active as rebels. Rebels are involved in approximately 23 per cent of violence in the region, while rioters and protesters are involved in 19 per cent and militias in 17 per cent. In contrast rebels are engaged in over 40 per cent of political violence in Central Africa. The Sahel reflects a more diverse range of actors, suggesting that there are multiple ways in which various groups engage with the political environment of the state. Yet, the Sahel’s regional profile is shaped by considerable internal variation across Sahelian countries (see Figure 6). For instance, rebels are responsible for over 40 per cent of conflict events in Mali compared to 8 per cent in Mauritania and less than 1 per cent in Burkina Faso- the latter of which can be attributed to cross-border activity, rather than domestic groups. Similarly, state/military violence constitutes a relatively low share of conflict in Mali and Burkina Faso when compared to Niger, where the state is active in approximately 50 per cent of conflict events. 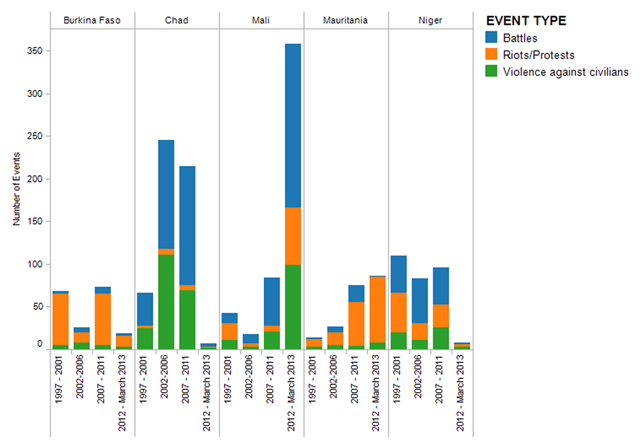 Other distinctions worth noting include the variation in dominant conflict event types across the Sahel. The proportion of violence in which civilians are targeted, for example, is highest in Chad, though it has been on the decline over the course of the dataset; the proportional increase in attacks targeting civilians has been steady and regionally most significant in Niger since 1997. In absolute terms, Mauritania and Burkina Faso experience comparably low levels of violence against civilians, while Mali has witnessed the highest levels of civilian targeting in the most recent time period (2012 – March 2013) (see Figure 7). 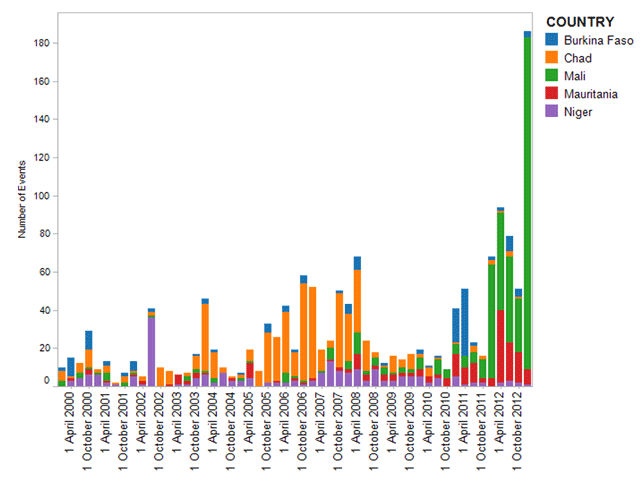 One of the more striking divergences from regional trends is the high level of protest activity in Mauritania where, in spite of narratives of crisis and fragility, there appears to be a significant and growing role for non-violent demonstrations and civil society in the political arena (see Figure 8). The most consistent type of violence is communal conflict, which refers to violence between militia groups which identify themselves by ethnic or highly localised communal identities. This type of violence represents an average of 4 per cent of conflict regionally, and differs only notably in Mauritania (see Figure 6). In addition to these geographic and temporal dynamics, there are notable differences across specific conflict actors and groups. The role of Al Qaeda in the Islamic Maghreb (AQIM) has received considerable attention in light of its involvement in northern Mali, and the characterisation of Sahelian violence as intermingled with North African conflict more generally is largely derived from the activity of this group. Analysis of AQIM ‘events’ reveals that over the course of the past six years, the vast majority of its violence has been concentrated in Algeria, shaped by its national agenda for regime change. 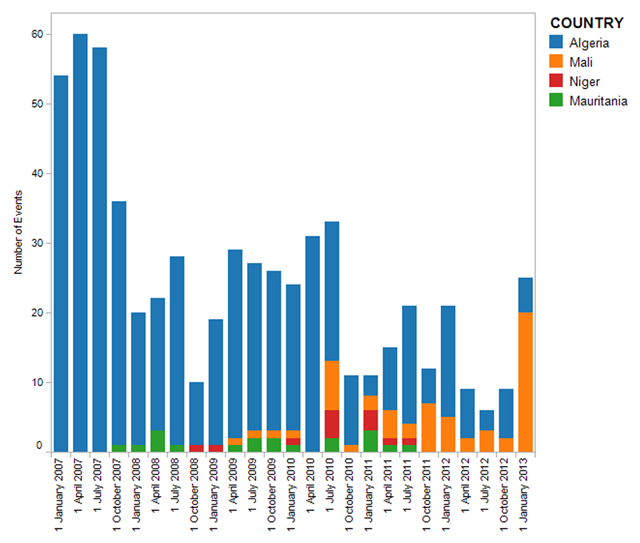 The year 2010 marked a turning point in the group’s involvement in conflict in neighbouring countries, driven in part by the intensification of the Algerian military’s campaign in southern Algeria and the almost total cessation of AQIM’s activity in the north of the country (see Figure 9). In addition to a regional presence, AQIM activity has provoked a regional response which has drawn a wide range of regional African militaries into contact with the group. 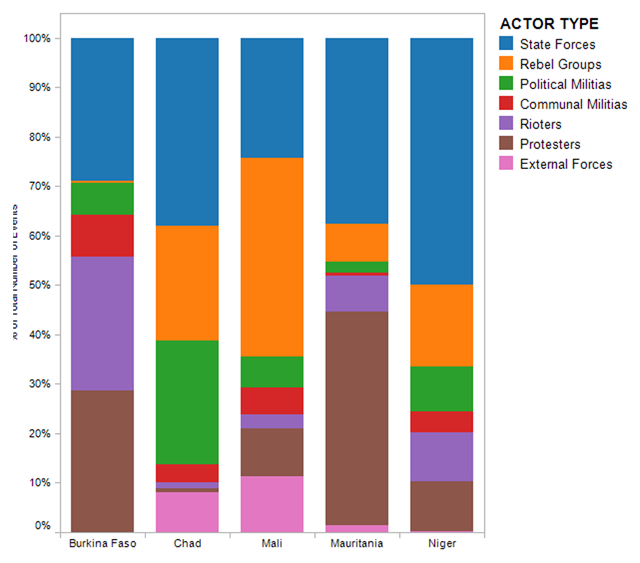 Another significant type actor in the region is the wide range of Tuareg militant groups, which are active across Mali, Niger, Burkina Faso and to the north in Algeria and Libya (see Figure 10). There are three characteristics of Tuareg political violence that largely reflect how each state handles ethno-regional inclusion: first, Tuareg communities represent significant ethno-regional minorities or majorities across many Sahel states and hence demand a role within government. Second, different Tuareg communities of relative military and political strength and significance – notably in Mali and Niger – engaged in violence to pursue this goal; after decades of low-level conflict, each state reached separate peace deals on integration. Third, the capacity and willingness of states to engage with and integrate Tuareg populations continues to be an issue: in Mali, the state’s record of Tuareg integration is especially poor. Meanwhile in Niger, the chequered progress led to an escalation in violence during early 2007, which continued until a stalemate in mid- to late-2008. Peace talks in Niger begin February 2009, followed shortly by a split in the MNJ (Mouvement des Nigériens pour la justice) rebel group, which undermined its capacity and ability to negotiate with the government.5 This fracture led to the disposal of arms in June 2009. Violence has to date not re-started in Niger in spite of the broader engagement of Tuareg groups in conflict in the region. 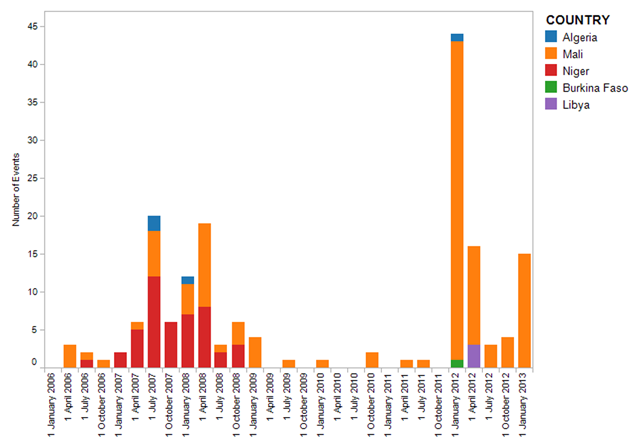 Figure 10 maps the distinct locations of violence in the 2006–2008 and 2011-April 2013 periods. This analysis has attempted to highlight evolving patterns and dynamics of conflict activity within and across the Sahel region, and in a broader comparative perspective, through use of the disaggregated data on conflict events and associated fatalities. Through this, several key points can be observed: in the first instance, in spite of recent media and policy attention on Africa’s ‘arc of instability,’ conflict levels in the Sahel as a region remain regionally among the lowest on the continent, even when taking into account the most recent spike in activity in Mali over the past year. Furthermore, the region has to date been characterised by low-grade and consistent growth in conflict levels, as distinct from the sustained high levels of conflict and marked volatility witnessed elsewhere on the continent. In addition, in spite of a general tendency to conceive of developments in the Sahel in regional, trans-national terms, it is clear from the data that the vast majority of the increase in conflict activity has been driven by violent events in a single country: Mali. While the sharp escalation of conflict in northern Mali represents a departure from the most recent conflict patterns in the country, a longer historical view of the data reveals preceding spikes in conflict levels and fatalities, reflecting the depth and persistence of underlying drivers of conflict. Narratives of a ‘regional crisis’ should be interrogated more thoroughly in light of the available data on violence, governance and fragility in these states. 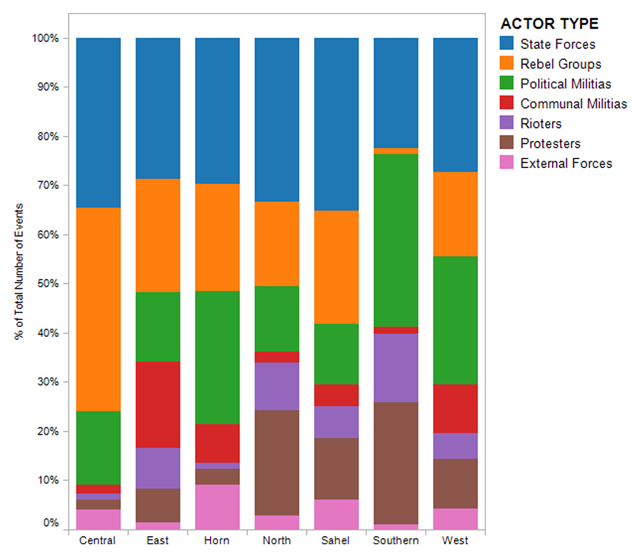 This point speaks to a broader imperative to consider the intra-regional variation across Sahelian states: data on dominant actor and event types within the region speak to pronounced discrepancies between the conflict profiles of each constituent state, which should inform attempts to draw broader regional lessons and conclusions on peace and conflict in this vast area. This is not to deny the trans-boundary nature of select actors in the region – most notably, AQIM and a range of Tuareg separatist groups – but to highlight the need to interrogate and challenge generalisations which obscure important regional, national and even local variations. 1All data is drawn from the Armed Conflict Location & Event Dataset (ACLED), online at acleddata.com. 2See acleddata.com for published data. 3In this article, regions are defined as follows: Central Africa (Angola, Burundi, Central African Republic, Democratic Republic of Congo, Equatorial Guinea, Gabon, Republic of Congo, Rwanda); East Africa (Kenya, South Sudan, Tanzania, Uganda); the Horn of Africa (Djibouti, Eritrea, Ethiopia, Somalia, Sudan); North Africa (Algeria, Egypt, Libya, Morocco, Tunisia); the Sahel (Burkina Faso, Chad, Mali, Mauritania, Niger); Southern Africa (Botswana, Lesotho, Madagascar, Malawi, Mozambique, Namibia, South Africa, Swaziland, Zambia, Zimbabwe); and West Africa (Benin, Cameroon, Gambia, Ghana, Guinea, Guinea-Bissau, Ivory Coast, Liberia, Nigeria, Senegal, Sierra Leone, Togo). 4The MNJ is a predominantly Tuareg rebel group which emerged in northern Niger in 2007, alleging neglect and marginalisation by the government of the region. 5Map author: Léa Macias; map visualisation provided by SpatialKey. Research and realtime coding is supported by, or in part by, the U.S. Army Research Office contract/grant number W911NF-09-1-007 under the Minerva Initiative of the U.S. Department of Defense. Caitriona Dowd’s work is supported by the GEOPV European Research Council Grant. Raleigh, C, Linke, A and Dowd, C (2012). Armed Conflict Location and Event Dataset Codebook, Version 2. Available at http://www.acleddata.com/wp-content/uploads/2012/ACLED_Codebook_2012.pdf [last accessed 29 May 2013].